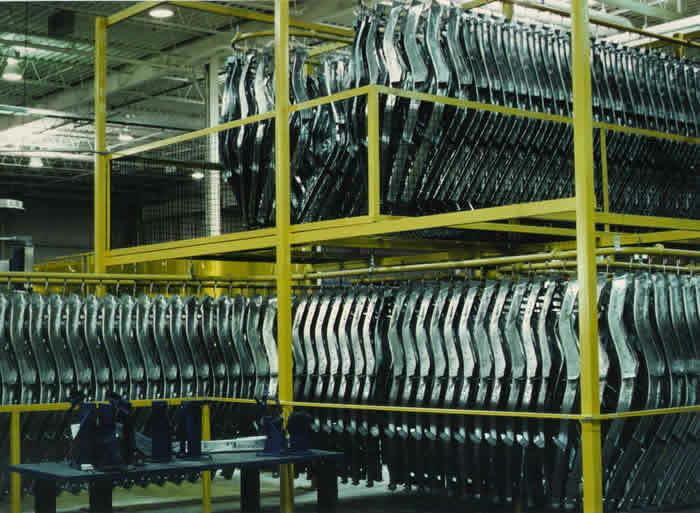 Under-body frame parts for the Auto Industry are successfully handled on this Pacline Overhead Conveyor. These irregular- shaped metal stampings convey smoothly between welding operations by being handled on the PAC-LINE™ enclosed track overhead conveyor as shown. Two 600 ft. long systems in a two-tier formation provide a buffer-zone for accumulation using a minimum of floor space. The PAC-LINE™ Conveyor chain travels inside the tubular conveyor track. Pendants are standard on 6-inch centers. The enclosed-track design protects the chain. Lubricant is kept clean; free of abrasive atmospheric dust and other contaminants. Small-radius curves for horizontal and vertical or sideways and up and down travel are standard. Roller turns, traction wheels, or sprockets common with I-beam type conveyors are not necessary. This promotes operator safety by reducing the number of pinch points, and significantly lowers the amount of maintenance required. The conveyor can be powered for continuous or intermittent variable speed travel. For additional information on your specific requirements, contact us.